Barcode Discount carries a wide variety of barcode scanners from top brands such as Motorola, Honeywell, Datalogic, Symbol, Unitech, Metrologic, Socket and many more. While one size does not fit all, we have a range of barcode readers that are laser, imager, corded, cordless, Bluetooth, fixed, in-counter, and presentation. We also have the latest barcode scanners and sleds that are compatible with smartphones and tablets, such as the iPhone and iPad. We not only have all the barcode scanning hardware you need to build the perfect barcode solution for your business, we also offer unmatched industry expertise and superior service every step of the way. 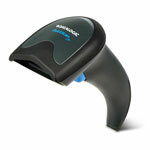 Search our catalog below for the right barcode scanner for your business. S1, USB Kit, 1D Linear Imager Scanner, Black. Includes 6' USB Cable and Stand. S2, USB Kit, 2D Imager Scanner, Black. Includes USB Cable and Stand. LS2208, USB Kit. 1D Laser. Includes USB cable and stand. Color: Black. Replaces (Part# LS2208-SR20007R-UR). S1-W, USB Kit, Cordless, 1D Linear Imager Scanner, Color: Dark Gray. Includes Standard Cradle (Radio/Charger) and USB Cable. S2-W, USB Kit, Cordless, 2D Imager Scanner, Color: Dark gray. Includes Standard Cradle (Radio/Charger) and USB Cable. S2-P, USB Kit, Presentation, 2D Imager Scanner, Color: Black. Includes USB Cable. QW2100, USB Kit, Linear 1D Imager. Includes USB 6' straight cable. Color: Black.